Uruguayan has barely featured for Juve this season. 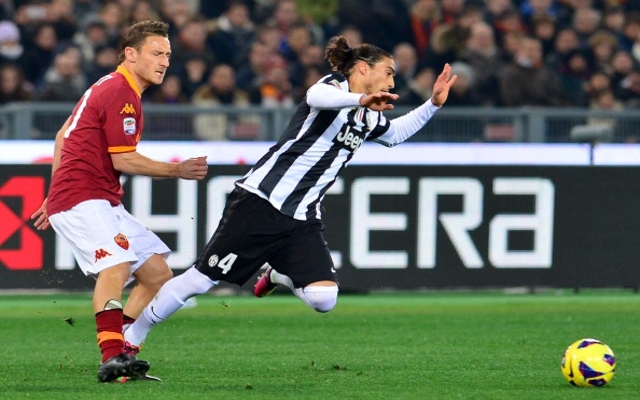 Premier League champions Manchester United are preparing a shock £7m bid for out-of-favour Juventus centre-back Martin Caceres at the end of this season, according to reports on Italian football website Tuttosport. The Red Devils are said to already be preparing for life at Old Trafford next season without both of their regular first-choice central defenders from the past eight years, Rio Ferdinand and Nemanja Vidic. Former England international Ferdinand is set to quit the Theatre of Dreams after 12 hugely successful years in the north west to pursue a new adventure with an as yet unnamed Major League Soccer franchise. Meanwhile, the veteran’s long-term partner at the back Vidic has already announced that he will also be leaving the Premier League giants come the end of the season after having not been handed a new deal by the club. And now as a result, Moyes is understood to be drawing up a short list of potential replacements for the experienced duo, with the name of the Serie A champions’ Uruguay international believed to be the United manager’s first-choice defensive target this summer. Caceres, 26, is currently contracted to the Old Lady of Italian Football until June 30 2016, but by all accounts Juve are happy to let the player leave Turin this summer.